We ran out to see Toy Story 3 this weekend. My hubby is really good at catching all of the fun things they do in Pixar films, and I usually miss half of them (if not more) so here are the fun things we found out, either from ourselves or with a little research! The "Toy" (Toyota) truck made an appearance as usual! I think that is what always reminds me they do this sort of thing! It has been in every movie since the original Toy Story! In Andy's grown up room, there are over 300 stickers on his wall. I counted. Kidding, I found that on the web. And a bunch of them are from Pixar movies past and even future. My favorite (because UP is one of my favorite movies) is the post card on Andy's billboard addressed to Carl and Ellie Fredricksen. The bulletin board also has other stuff on it, like references to Pizza Planet. 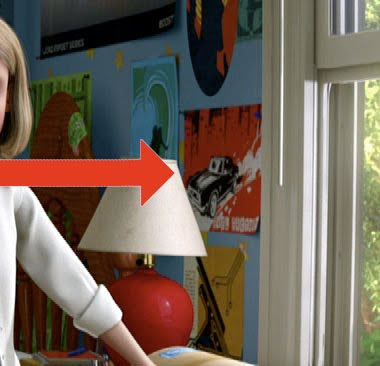 Above Andy's door there is a sign from W. Cutting, which is where Pixar originally was headquartered and the map in Andy's room has pins in all the home towns of the production staff of the movie. There is a PU (Pixar University) penant on Andy's Wall. A lot of Pixar movies have a reference to A113 in them, the animation classroom number from CalArts where many of the head Pixar people attended, and it is Andy's mom's license plate number in this movie. The number 95, the year the first Toy Story was released, shows up a lot in Pixar films. 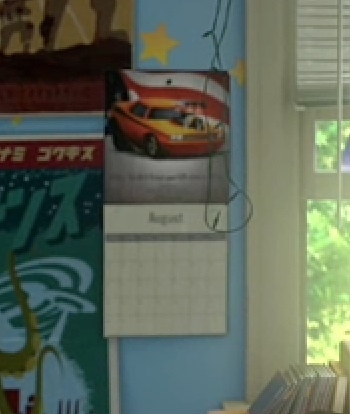 It is on the train in the opening sequence and is Lightning McQueens number in Cars to name a couple. There are a TON of toys at the Daycare that are significant. The stingray from Nemo is on the shelf, Wall E is being played with, there is a lightning McQueen toy and a kid wearing a Lightning McQueen shirt. The tractor from Cars as well as the Fire Truck. The batteries in Buzz were from Buy N Large. Do you remember that name from Wall E? And the other batteries you see in the film are Re-Volting, which was a sponsor of the number 84 race car in Cars. 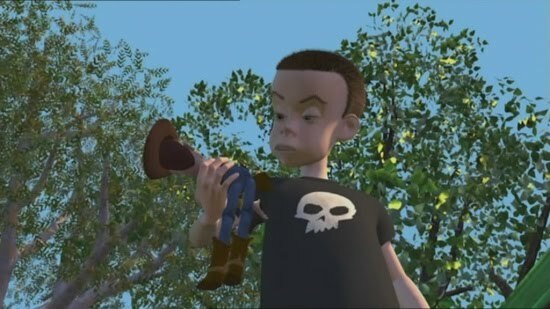 A lot of the mean toys look strikingly familiar...pieces of them were in the toys in Sid's room in the original Toy Story. Bonnie has a Wall-E patch on her backpack. Flick is one of the toys that hides right before the kids burst into the room for the first time in the daycare. Pixar likes to hide characters from their future movies in their current releases. You never know who they are until after the next movie is released. Boo’s fish toy in Monsters Inc ended up being the title character of Finding Nemo. A kid in the doctor’s office in Finding Nemo was reading a comic book of The Incredibles. WALL-E appeared in 2D on the Ratatouille DVD short film Your Friend the Rat. And Up’s Dug the dog appeared in silhouette in Brad Bird’s Ratatouille chasing Remy through the walls of a building. Lotso was in UP! In the scene where the balloons go past the window of the little girls room, he is under her bed! since there is a Monsters Inc 2 being released. She is even holding a Kitty and says Boo! to her toys while she is playing. Have you seen it yet? Did you love it? Did you cry? What did you catch that we missed? We saw it yesterday and yes, I totally cried!! I caught some of those things, but not even close to all of them. I love all those fun facts! I can't wait to see the movie! We are going this weekend so I will be on the lookout!! we saw it yesterday! amazing! cute, funny, sad, sweet...it had it all. I totally cried. That is so cool. We just saw it on Saturday and loved it! I didn't even notice any of that. I saw it yesterday and LOVED it! Those facts are so cool, and now I can't wait to watch for them when I watch it again!! I can't wait to see it! I never noticed any of those things how fun! Wow! Love this & can't wiat to see the movie. I am SO not that observant lol! We saw it friday in 3D (so not worth the up sell!) but we LOVED the movie! I love how they didn't make the bad bear turn good! Now waiting on despicable me! It's soooo flllufffy! I saw it today with Finn and cried! I thought I was the only one! I was so happy that there was a Zurg! We are hopefully going this weekend as long as they bring it to the theater close to us. We are hoping. It was shrek this weekend and I didn't think the middle daughter would sit still to watch. So we are waiting for Toy Story and hopefully we will get to go see monsters inc 2 in theaters too with the girls! Aww cute...haven't seen it yet, so I won't read any of the comments, but I'm sure it's great. I hope we get to watch this one in the theatre! We LOVED it. I cried. : ) I just read an interview w/ the boy who did Andy's voice in all 3 movies. What a great kid. He said at the end of each movie, during the credits is a section called Pixar Babies and lists all the babies born to staff during the making of the film. Cute! Up is my all-time fave. I am laughing because I thought I was the only one who cried, and I blamed it on being pregnant! 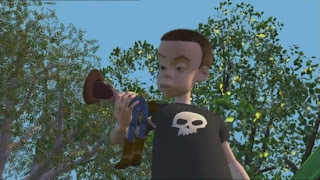 It was a great ending to the Toy Story series. Loved Spanish Mode Buzz! I Loved it! We went for Father's Day since the original two are my husbands favorite animated movies from when he was a kid. I cried a ton. But it was a great ending to the series! We caught a couple of the things, and were talking about it the entire ride home. 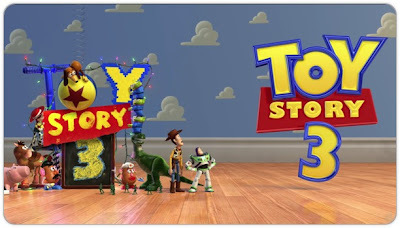 I had a Toy Story party on Sunday for my 3 year old and we went to see the movie, I missed almost all of that. Thank you for sharing. I just posted the pictures and info from the party, along with some free printables. I posted a link to your post.